From the manufacture of the northern European birch plywood, and including the shipping to the UK, to the manufacture of the Morfus components in Derbyshire, all CO2 emissions are calculated. Trees are then planted under the Woodland Carbon Code that sequester this same quantity of CO2. Designed on a 600mm horizontal and 345mm vertical module Morfus satisfies bookcase, display and archiving needs. And with 300mm deep and 450mm deep versions Morfus is engineered to provide almost limitless possibilities to configure it exactly the way you need it. Customisable with doors, drawers, pull-out boxes and shelves to match your colour scheme, and reconfigurable to meet you changing needs Morfus is endlessly adaptable. Floor mounted, wall hung or sitting legs Morfus responds to how your space needs to work. Engineered from 18mm high quality birch plywood with a factory applied melamine finish, the patent pending Morfus system is designed to be tough and resilient. Assembled with tried and tested steel fittings Morfus has been FIRA tested and satisfied the requirements of BS EN 10121:2013 - Level 1. Designed to exploit the expressive, natural and tactile qualities of birch plywood, and using the interlocking assembly system to give further character, the white Morfus shapes and surfaces create the perfect complement to any space any time. Morfus® is a beautifully engineered interlocking birch plywood display and storage system for the home and office. It comes in many different compatible modules, accessories and colours making it endlessly adaptable to suit your space and your needs. 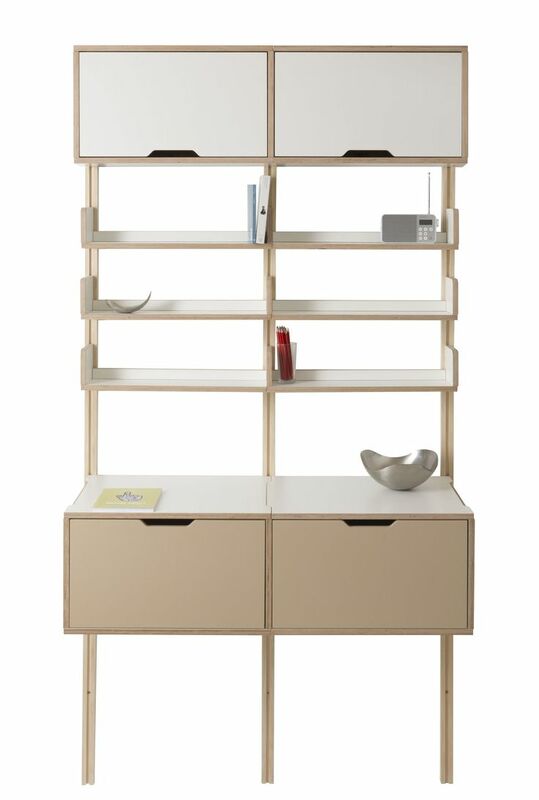 The Benji Bookcase range is 309mm deep and is designed as a 600mm or 750mm module width and a 345mm module height. The interlocking system can be extended horizontally using any combination of 600 and 750 modules and vertically to suit individual requirements. It can even be stepped to fit under sloping roofs or stairs. This Walli system comprises the standard Benji depth shelf units hooked onto vertical battens at 600 or 750mm centres. The modules can be either single stacked or extended horizontally. 720mm in height the 600 x 1200 mm Emmi table uses horizontal solid ash dowels to create a rigid subframe onto which the melamine faced plywood table top is mounted. 720mm in height the 600 x 1200 mm Elli table has inverted ‘L’ shaped plywood legs to match Benji and Sylvi legs and creates a classic modern look. Using plywood the Morfus way results in a product that is more stable, strong and uniform in all directions, and intrinsically less wasteful in manufacture compared to solid wood alternatives. The multiple module, accessory and colour options and the protective melamine finish with easily replaceable components make Morfus your most sustainable storage and display solution. Morfus® plywood comes from sustainable European FSC sourced Birch trees. All CO2 emissions are calculated from the northern European made birch plywood, shipping to the UK, manufacture and packing of the Morfus components in Derbyshire, and delivery to the customer’s door. Trees are then planted under the UK Woodland Carbon Code that sequester at least the same quantity of CO2. are the different variaitions of modules?